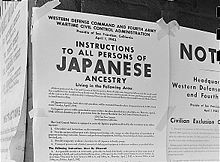 June 12, 1942, an Information was filed in the District Court for Northern California charging a violation of the Act of March 21, 1942, in that petitioner had knowingly remained within the area covered by Exclusion Order No. 34. A demurrer to the information having been overruled, the petitioner was tried under a plea of not guilty, and convicted. Sentence was suspended, and he was placed on probation for five years. We know, however, in the light of the foregoing recitation, that he was at once taken into military custody and lodged in an Assembly Center. We further know that, on March 18, 1942, the President had promulgated Executive Order No. 9102, [n7] establishing the War Relocation Authority under which so-called Relocation Centers, a euphemism for concentration camps, were established pursuant to cooperation between the military authorities of the Western Defense Command and the Relocation Authority, and that the petitioner has been confined either in an Assembly Center within the zone in which he had lived or has been removed to a Relocation Center where, as the facts disclosed in Ex parte Endo (post, p. 283) demonstrate, he was illegally held in custody. The Government has argued this case as if the only order outstanding at the time the petitioner was arrested and informed against was Exclusion Order No. 34, ordering him to leave the area in which he resided, which was the basis of the information against him. That argument has evidently been effective. The opinion refers to the Hirabayashi case, supra, to show that this court has sustained the validity of a curfew order in an emergency. The argument, then, is that exclusion from a given area of danger, while somewhat more sweeping than a curfew regulation, is of the same nature — a temporary expedient made necessary by a sudden emergency. This, I think, is a substitution of an hypothetical case for the case actually before the court. I might agree with the court’s disposition of the hypothetical case. [n8] The liberty of every American citizen freely to come and to go must frequently, in the face of sudden danger, be temporarily limited or suspended. The civil authorities must often resort to the expedient of excluding citizens temporarily from a locality. The drawing of fire lines in the case of a conflagration, the removal of persons from the area where a pestilence has broken out, are familiar examples. If the exclusion worked by Exclusion Order No. 34 were of that nature, the Hirabayashi case would be authority for sustaining it. [p232] But the facts above recited, and those set forth in Ex parte Endo, supra, show that the exclusion was but a part of an over-all plan for forceable detention. This case cannot, therefore, be decided on any such narrow ground as the possible validity of a Temporary Exclusion Order under which the residents of an area are given an opportunity to leave and go elsewhere in their native land outside the boundaries of a military area. To make the case turn on any such assumption is to shut our eyes to reality.